IQS Directory is a top industrial directory listing of leading industrial cotton rope manufacturers and suppliers. Access our comprehensive index to review and source cotton rope manufacturers with preview ads and detailed product descriptions. These cotton rope companies can design, engineer and manufacture cotton ropes to your specifications and application need. 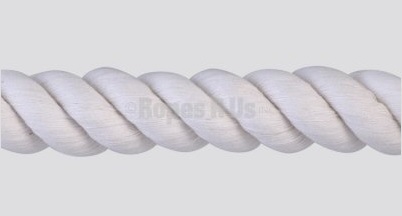 A quick and easy to use request for quote form is provided for you to contact these cotton rope manufacturers and suppliers. Each company has detailed profile information, locations, phone number, website links, product videos and product information defined. Read customer reviews and product specific news articles. We are the right resource for your information requirement whether its for a manufacturer of cotton twine, 5mm cotton cord, cotton nautical rope. We carry ropes ranging from simple cotton rope to much more extravagant. It is our goal to establish ourselves as the roping experts, and we have succeeded in our goal since our founding in 1967. You will find that our roping products are superior and able to handle any environment and use. Contact us today so we can help you find your perfect match! Cotton rope is, as its name suggests, rope made from cotton or a cotton blend such as cotton and polyester. Cotton, which is derived from the boll of Gossypium plants in the Malvaceae family, has been highly popular on a large scale since the invention of the modern cotton gin by Eli Whitney in 1793. Before that, cotton fibers were still used to make rope and clothing, but with much less speed and efficiency, As it stands now, this rope is one of the most commonly used types of natural rope, or cordage made from twisted fibers, today. It is widely used as and with clotheslines, sash cords, Venetian blind cords, jump ropes, hammocks, some gift packaging bags, furniture accessories and other decorative items. Also, it is the number one rope type used in the production of novelty products and animal toys. Soft and pliable with high handling quality, cotton rope can be handled by workers without irritating or causing injury to their skin, unlike many comparable synthetic fiber ropes that are bristly or abrasive. In addition, it is non-toxic, which is why it is such a good choice for use with animal toys. If an animal toy is made from synthetic rope, which may not be non-toxic, a pet could become ill. Cotton ropes also knots well, are unaffected by heat and can be recycled. This type of cordage is easy and inexpensive to produce; cotton ropes can be constructed using a variety of different design methods, including twisting and braiding. Twisted cotton rope is made simply, by twisting cotton fibers around each other. Usually, it involves twisting the fibers of three separate strands in one direction and then twisting the strands themselves in the other direction. This method of twisting gives the rope good balance and high strength. Properly twisted rope hangs straight and resists kinking. Braiding, on the other hand, is slightly more involved. It involves first twisting individual cotton fibers into strands and then interweaving those strands into a rope. Manufacturers can braid rope into a number of types of braids, such as diamond braids (over and under construction; available with or without core), double braids (braid over braid/two ropes in one), flat braids/tubular braids (simply braided with no inner core), hollow braids (any braid construction without a core; fully spliceable; capable of floating), solid braids (locked stitched with no core; high strength; low stretch) and twisted braids (three strand construction). Regardless of what construction a rope manufacturer chooses, after they have been constructed, cotton ropes and cotton rope products can be protected from unraveling and fraying by windings and/or, from time to time, shrink wrap. Likewise, they are available as polished or unpolished products. Naturally white, cotton ropes can easily be dyed any color. Because of its quick turnaround times and low price tag, cotton rope is the ideal material for use in large scale applications and small scale consumer applications. Cotton ropes offer users many great advantages. Unfortunately, they present some disadvantages as well. Mainly, the drawback of cotton ropes is the fact that they are not very strong or durable, especially when compared to other synthetic and natural fiber ropes like manila, polypropylene and nylon. Likewise susceptible to damage and degradation at the hands of water, oil and other chemicals, cotton rope is rarely called upon for use in demanding commercial or industrial applications. Rather, fiber ropes like those just mentioned are almost always chosen over cotton rope for jobs like these, as they display much higher levels of chemical resistance, durability and tensile strength. Nevertheless, cotton ropes are an excellent choice for use not only with those applications mentioned earlier, but also as ropes and cords like awning cords, rope handles of decorative gift bags, camping rope, stage or theater rope, rope used with other types of blinds and curtains and rope used with store displays. Cotton rope manufacturers and distributors are more than happy to provide their customers with standard and custom rope assemblies that meet the unique needs of their applications. They offer their ropes in different thicknesses, weights, tensile strengths, lengths and diameters. To get the most out of their ropes, customers should treat them with care. Some tips for maximizing working rope life include those related to style of use and storage. First, users of cotton ropes should be careful to not overload them or place sudden strain on them, as these two things can seriously weaken them. Second, users should avoid exposing their rope to chemicals or chemical fumes, as these can cause severe damage. Third, cotton ropes should be stored up off the ground, in a well ventilated area, as they and other natural ropes are susceptible to mildew and decay. Cotton Ropes – Ropes R Us, Inc.
Cotton Ropes – MCM Ropes & Rigging Ltd.